The Washington Post "10 Best Graphic Novels of the Year"
New York magazine "The Year's Most Giftable Coffee-Table Books"
The Verge "10 Best Comics of the Year"
Oklahoman "Best Graphic Novels of the Year"
From the #1 NYT bestselling author of Can't We Talk About Something More Pleasant?, Roz Chast, an "absolutely laugh-out-loud hysterical" (AP) illustrated ode/guide/thank-you to Manhattan. New Yorker cartoonist and NYT bestselling author Roz Chast, native Brooklynite-turned-suburban commuter deemed the quintessential New Yorker, has always been intensely alive to the glorious spectacle that is Manhattan--the daily clash of sidewalk racers and dawdlers, the fascinating range of dress codes, and the priceless, nutty outbursts of souls from all walks of life. For Chast, adjusting to life outside the city was surreal (you can own trees!? you have to drive!? ), but she recognized that the reverse was true for her kids. On trips into town, they would marvel at the strange visual world of Manhattan--its blackened sidewalk gum wads, "those West Side Story–things" (fire escapes)--its crazily honeycombed systems and grids. 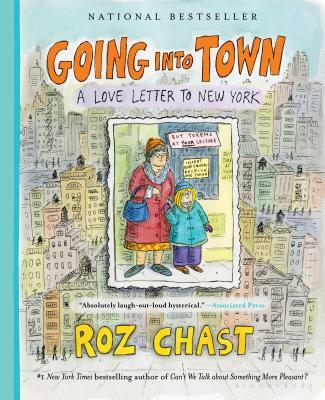 Told through Chast's singularly zany, laugh-out-loud, touching, and true cartoons, Going into Town is part New York stories (the "overheard and overseen" of the island borough), part personal and practical guide to walking, talking, renting, and venting--an irresistible, one-of-a-kind love letter to the city. “The New Yorker magazine cartoonist has a style and sensibility like no one else's. Here she employs it in a graphic memoir of and tribute to New York City. Though she now lives in the Connecticut suburbs, Chast grew up in Brooklyn . . . As her own daughter prepared to move to the city for college, Chast compiled this volume that lets readers see New York through the artist's eyes.” —Newsday, "Best Fall Books"
“For New Yorkers past and present, as well as those who admire the city from afar, this book is sure to delight.” —Bookish, "The Must-Read Books of Fall 2017"
“Love New York? So does Roz Chast, and we're the luckier for it . . . A handy reminder of what makes the city lovable, maddening and a little gross.” —The Forward's "These Are the 23 Books You Need to Read this Summer"
“The great New Yorker cartoonist salutes Manhattan.” —Milwaukee Journal Sentinel, "75 books for holiday gift giving"
“Whatever your experience of New York City, Chast will add to it in her inimitable laugh-out-loud way. There may be a better, funnier cartoonist working in the world today, but none that I know of.” —Daily Herald, "Book Buzz: What to Read"